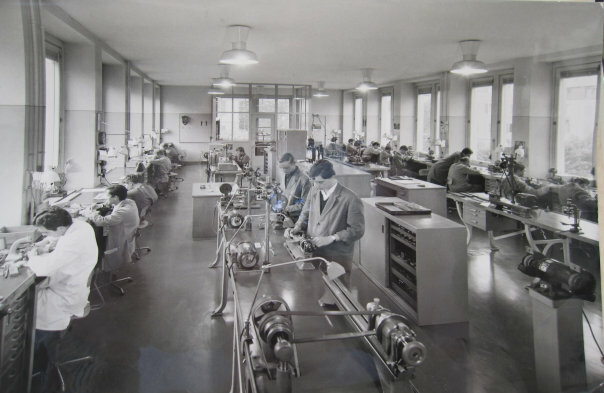 Technicum School of La Chaux-de-Fonds Switzerland, a four years program to become a watchmaker, forty hours per week. Charles Fleury and Andre Fleury graduated from that school. Few years after graduation Andre Fleury moved to San-Francisco where he open his office and built a serious clientele who appreciates quality. In 1981 Andre moved his office to San Rafael where he operates his business since. His son Sacha learned the watchmaking art from his father for three years and been a major asset of the Fleury's business for the last sixteen years. Sacha his the fourth generation of Fleury watchmakers. In our office we specialize in servicing high grade watches such as Patek- Philippe, Rolex, IWC, Baume Mercier, Tag and JL mainly. Other brands that we did serviced for decades are now indulging in parts monopoly and anti-competitive practices to place you the consumers at their MERCY. The major culprit of monopolistic and anti-competitive practices are: Cartier, Vacheron-Constantin, Audemars-Piguet, Blancpain, ebel, Omega and more. Since we did serviced these brands for over forty years, we may still have what is necessary to service your watch. We also produce a quality watch call The Dressy Sport Watch. All are water-resistant, sturdy and elegant. Click on product above to see our models. Parts restriction was designed by very powerful Swiss watch companies to place you the consumers at their mercy by systematic elimination of the competition of the independent watchmakers. That competition like in any other business, is essential to keep price and quality in control. The Sherman/Clayton Act. Designed to protect you the consumers against financial abuses and keep our small businesses alive must be enforced by our Federal Trade Commission and Department of Justice, both choses to ignore these abuses and the lost of approximately 33,500 watchmaker's jobs. Andre Fleury Swiss Watch Company LLC.